CCCalc is a free calculator for Windows, ideal for everyday quick calculations. Performs four basic arithmetic operations, percent allowed. Applies no limitations on precision. Remembers everything you've entered until you delete it yourself. Allows you to browse through calculation history as if it were a text and reuse the numbers or correct any misprint anywhere. 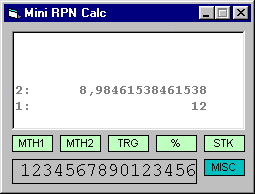 This is a small, easy to use, RPN calculator. All basic operations are handled and stack can store as many items as you want. RPN (Reverse Polish Notation) calculation is a smart way to compute numbers, results are stored into a stack for later use. If you are an expert in RPN you will love the quick access to functions, if you are new to RPN, you won't be overwhelmed by too many buttons. GlassCalc is a simple calculator with extensive support for mathematical expressions. Instead of using buttons, it has a text input and keeps a full history of expressions and results. It also has full support for user-defined functions and variables, base conversions, exponential notation, and more. GlassCalc now features syntax highlighting and brace matching to make it easier to enter complex expressions. Soroban is the multiple precision arithmetic program which calculates using the same technique as an abacus. High-speed operation of the abacus, multiple precision arithmetic of a maximum of 50 figures. You can customize the number of digits on the abacus, the type of ball, and the animation speed. If you have a wide-screen monitor you can fill it with a huge abacus!